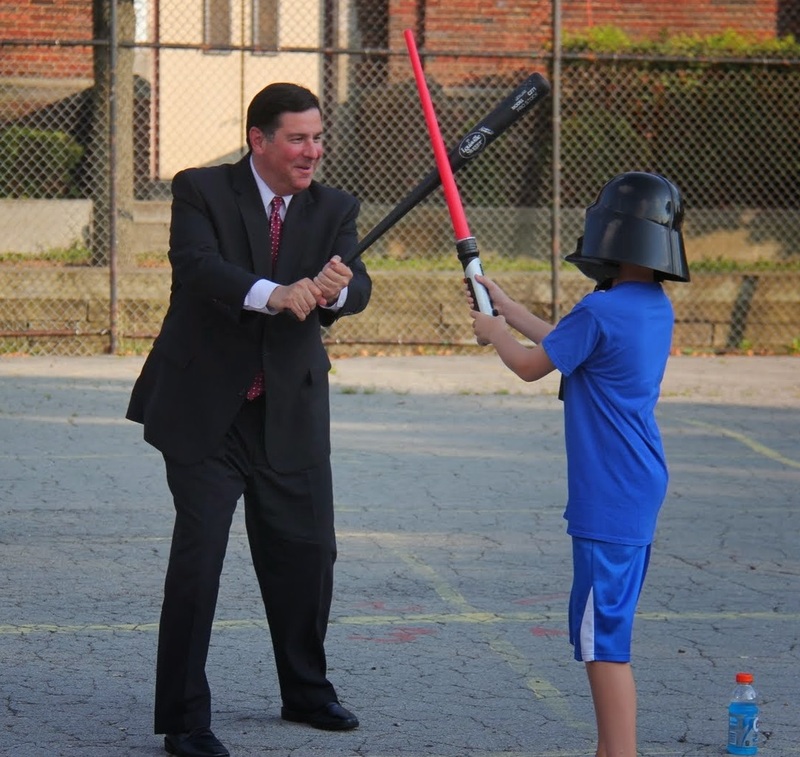 Some more photos have surfaced of Mayor Bill Peduto’s legendary appearance at the wiffle diamond this past Tuesday night. The Mayor addresses the league after tossing the first pitch. The Mayor battles Darth Vader with a wiffleball bat. Light sabers are no match for the wiffle stick. 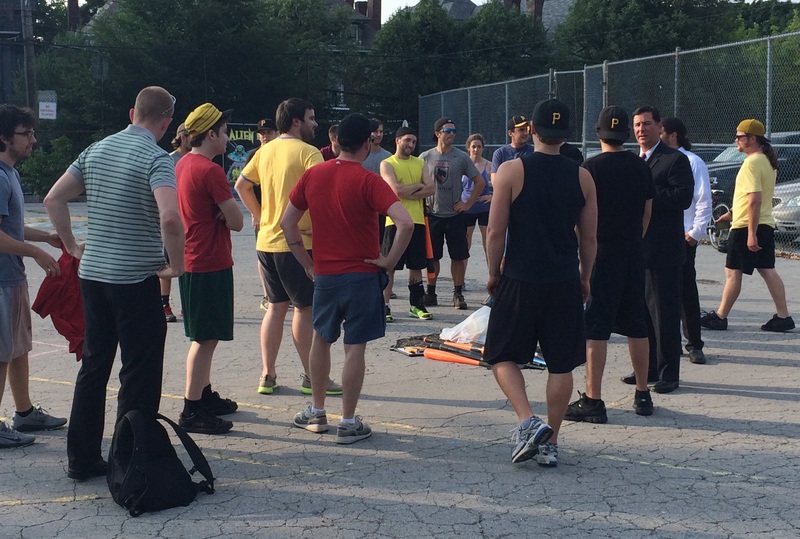 It was a historic night for the Ellsworth Wiffleball League, as Mayor Bill Peduto returned to his old stomping grounds for an appearance prior to the first round playoff action Tuesday night. 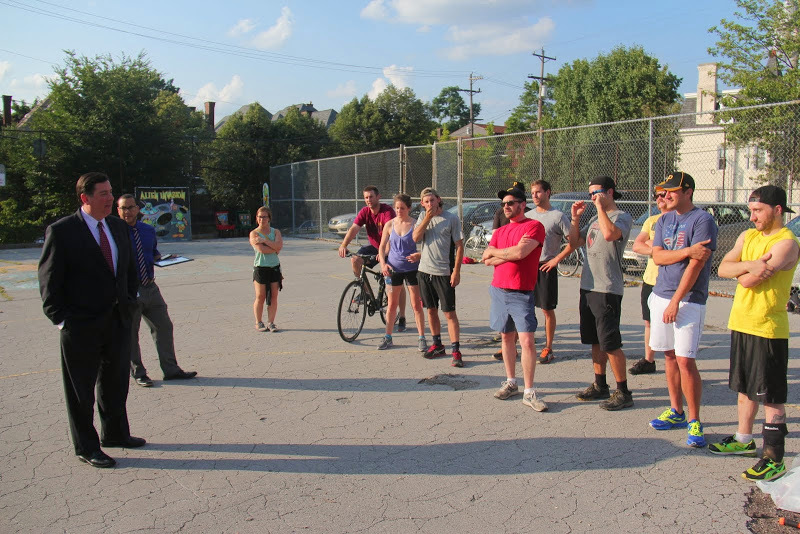 The EWL superstars cheered as Pittsburgh’s 60th Mayor strolled into the wiffle diamond and greeted players and fans alike. 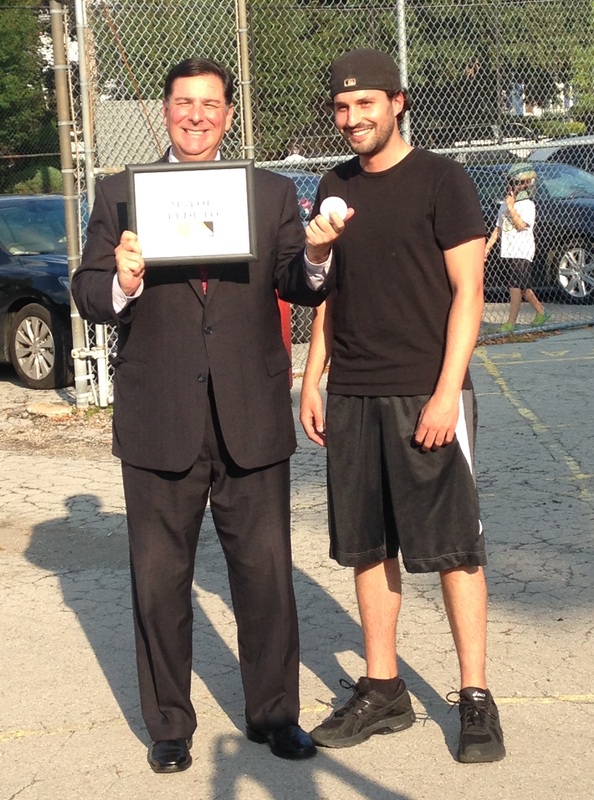 The Mayor accepted a plaque designating him as a Wiffle Ambassador before posing for several photos with the league. 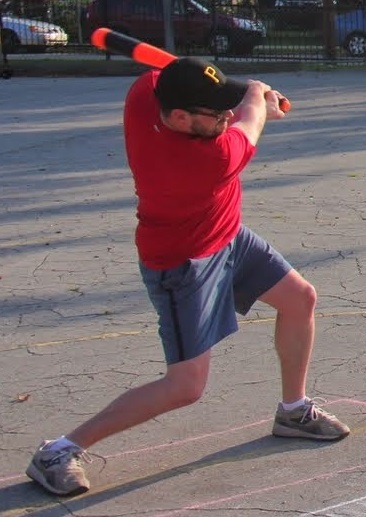 As a Wiffle Ambassador, Mayor Peduto will be charged with “promoting the great past time of wiffleball, testifying to the majesty of the game, representing the wiffle spirit, and exemplifying true wiffleosity.” After accepting the honor, the Mayor then took the mound for a ceremonial first pitch. He stomped in, wound up, and delivered a sinking left-handed wiffle curve across the plate for what appeared to be a strike. The crowd erupted, and the mayor shook hands with the EWL Commissioner before speaking briefly with the league about what they do for a living, where they live, and the history of the league. The Mayor explained that years ago he often played dek hockey on the same grounds which now host the Ellsworth wiffle diamond. The Mayor delivers the ceremonial first pitch prior to Tuesday’s playoff game. The EWL would like to thank the Mayor for making an appearance and would also like to thank his office for coordinating the event. Due to a previously scheduled Boys & Girls Club event at the wiffle diamond, only one playoff game was completed Tuesday night. The Ham Slams held on for a dramatic 4-3 win over Cookies & Cream, forcing a pivotal and deciding game 5 which will be played Thursday night. With the series tied at 2-2, the winner will move on the Wiffle Series. Meanwhile, Eastbound & Dahn and Questionable Outfit will settle their series next week to determine who will advance to the championship round. Questionable Outfit is up 2-1 in the series, and Eastbound & Dahn will have to win two consecutive games to pull off the first round upset. Stay tuned for photos and a recap of the Ham Slams/Cookies & Cream game 4 matchup. The 60th Mayor of Pittsburgh will throw the first pitch during tomorrow’s first round playoff matchups. 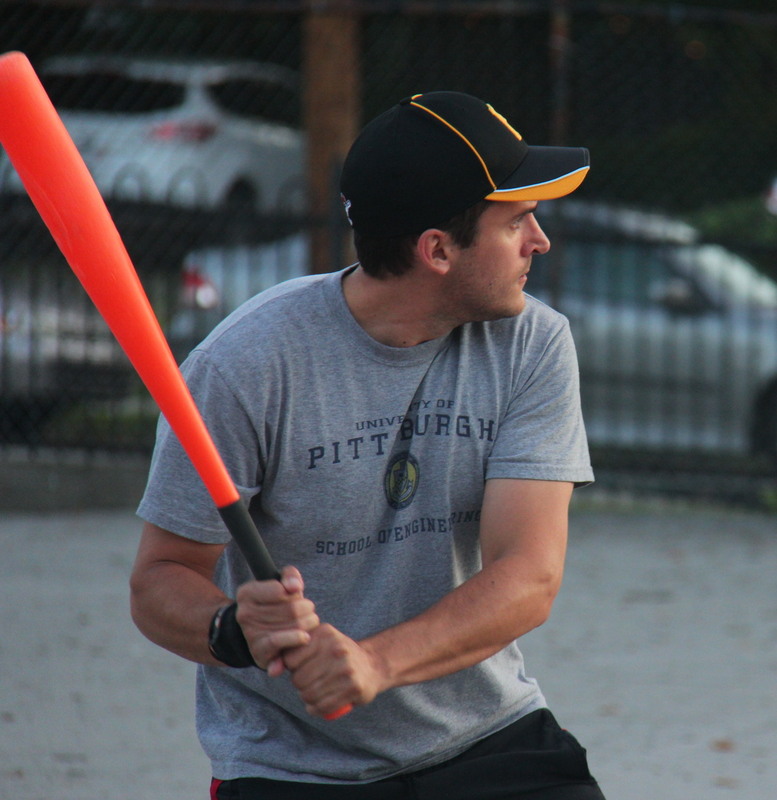 History will be made at the wiffle diamond in Shadyside tomorrow, as Bill Peduto, the Mayor of Pittsburgh, will be in attendance to throw out the first pitch prior to the start of the regularly scheduled playoff games. The Mayor plans to unleash his “mean, left-handed wiffle curve” as the stars of the Ellsworth Wiffleball League look on. 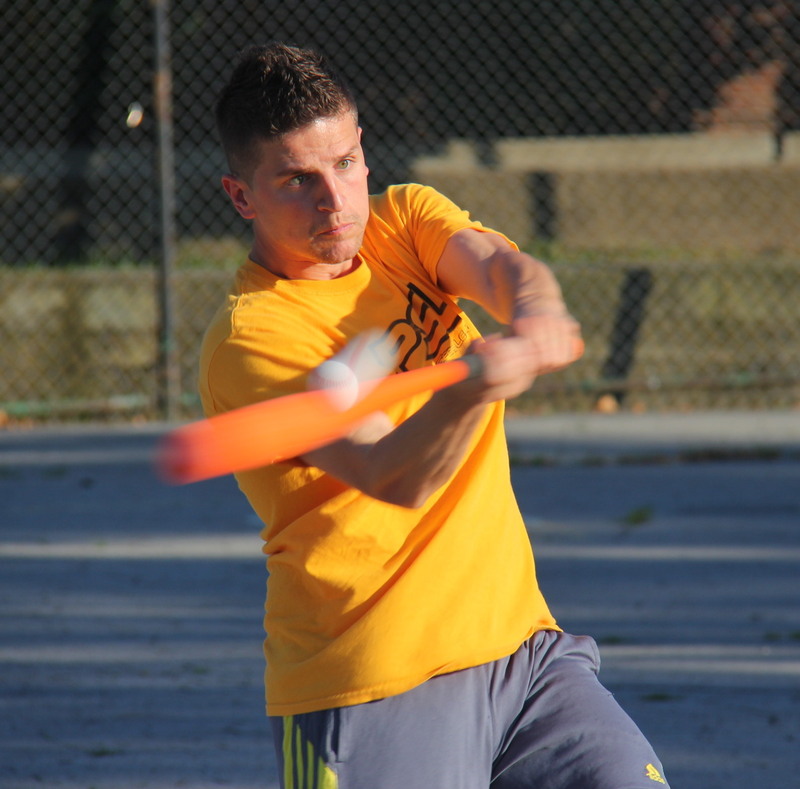 Fans and former EWL players are invited to attend what will go down as one of the most important wiffle events in wiffle history. Questionable Outfit holds a 2-1 series lead in the best-of-five wiffle series against Eastbound & Dahn. The strong favorites to win the title heading into the playoffs, Questionable looks to advance to the Wiffle Series for the second consecutive year. Eastbound & Dahn stunned Questionable Outfit in the opener of the series, and they hope to win two straight games to pull off the greatest upset the league has seen to date. Cookies & Cream are ahead of the Ham Slams 2-1 in their best-of-five first round matchup. The series has went back and forth with Cookies & Cream winning games 1 and 3 easily and the Ham Slams controlling the scoring in game 2. Cookies & Cream are the defending champions of the EWL and will attempt to become the first repeat champions, while the Ham Slams hope to advance past the first round for the first time in franchise history. 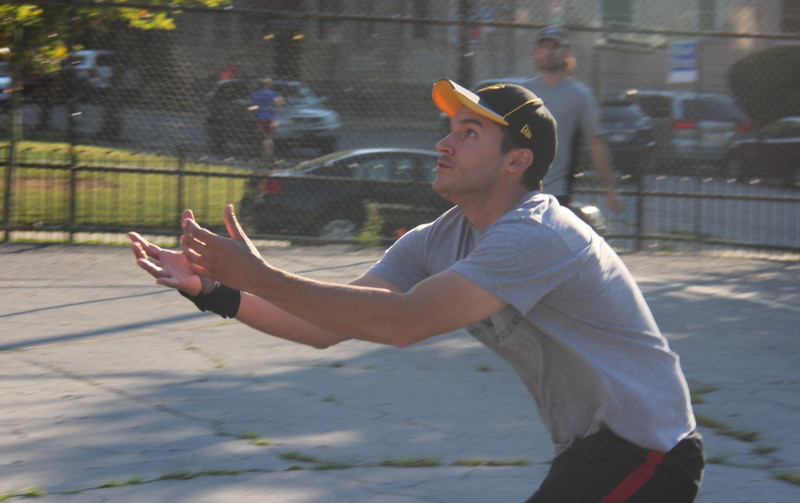 Wiffle action starts at 6:30PM sharp and will go until approximately 8:30PM. Guthrie allowed only 3 hits in a dominant complete game win, as the Cookies & Cream offense provided more than enough run support to top the Ham Slams 5-1, giving Cookies a 2-1 lead in the best-of-five series. 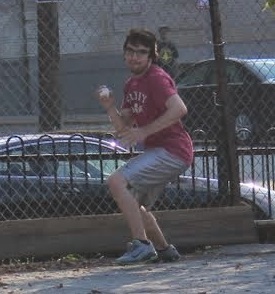 For the third consecutive game, the Ham Slams sent Charlie to the mound to start against Cookies & Cream. He retired Guthrie to start the game, but Cookies would rally with one out to pull ahead early. Blose hit a solo homer to put Cookies & Cream ahead 1-0, and Joey made it back-to-back jacks when he went deep, making the score 2-0. Charlie would then retire Dinger to end the inning, but the two early runs would be all Cookies would need. Guthrie rolled through the bottom of the first, retiring Anthony and Steve in order. Charlie got back on track in the top of the second, pitching a scoreless inning. Guthrie matched him in the bottom half of the inning, sending Charlie and Anthony down consecutively. Charlie continued to pitch effectively in the top of the third, sending Joey and Dinger down in order. The Ham Slams would cut the deficit in half in the bottom of the third. Steve led off the inning with a double, and Charlie followed with a pop fly in foul territory along the first base line. Guthrie raced over to catch it, but made a throwing error, and Steve tagged up, racing from second to home to score. Guthrie retired the next batter to end the inning with the score 2-1. It didn’t take long for Cookies & Cream to make up the runs. Guthrie led off the inning with a solo homer, making the score 3-1. Blose then tripled, and Joey followed with a single, driving him in to extend the lead to 4-1. Joey moved from first to second on a Dinger groundout, and Guthrie got his second hit of the inning, and RBI single, scoring Joey to make the score 5-1. Charlie retired the next batter to end the inning, but the Ham Slams would trail by four runs. Guthrie cruised through the bottom of the fourth, retiring the side without allowing a hit. The Ham Slams removed Charlie from the mound in the top of the fifth, opting for Steve for a relief appearance, his third of the series. He gave up a single to Joey to start the inning, but stranded him by retiring the next two batters. Guthrie gave up a one-out single to Steve in the bottom of the fifth, but the Slams couldn’t reduce Cookies’ 4-run lead, as Charlie struck out to end the inning. Steve would give up a one-out double to Joey in the top of the sixth, but once again stranded the runner, retiring Dinger to end the inning. Down 5-1, the Ham Slams needed a rally in the bottom of the sixth. Anthony flew out to the mound for the first out of the inning, and Steve followed with a one-out triple. But Guthrie buckled down, retiring Charlie to end the inning and the game, giving Cookies & Cream a 5-1 game 3 win. The win put Cookies & Cream ahead 2-1 in the best-of-five series and put the defending champions on the verge of a repeat trip to the Wiffle Series. – Guthrie pitched the complete game win for Cookies & Cream, going 6 innings while giving up 1 earned run on 3 hits and striking out one. 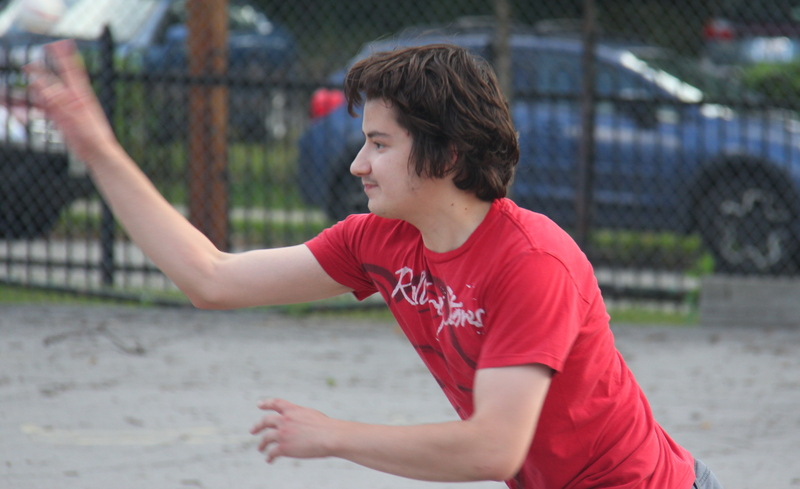 – Charlie took the loss for the Slams, allowing 5 earned runs on 6 hits in 4 innings pitched. Steve pitched 2 innings of scoreless relief, allowing 2 hits. – Joey led Cookies & Cream at the plate, going 4-for-5 with 2 singles, a double, a homer, 2 runs scored, and 2 RBI. – Blose also went 2-for-5 for Cookies with a triple, a home run, 2 runs scored, and an RBI. 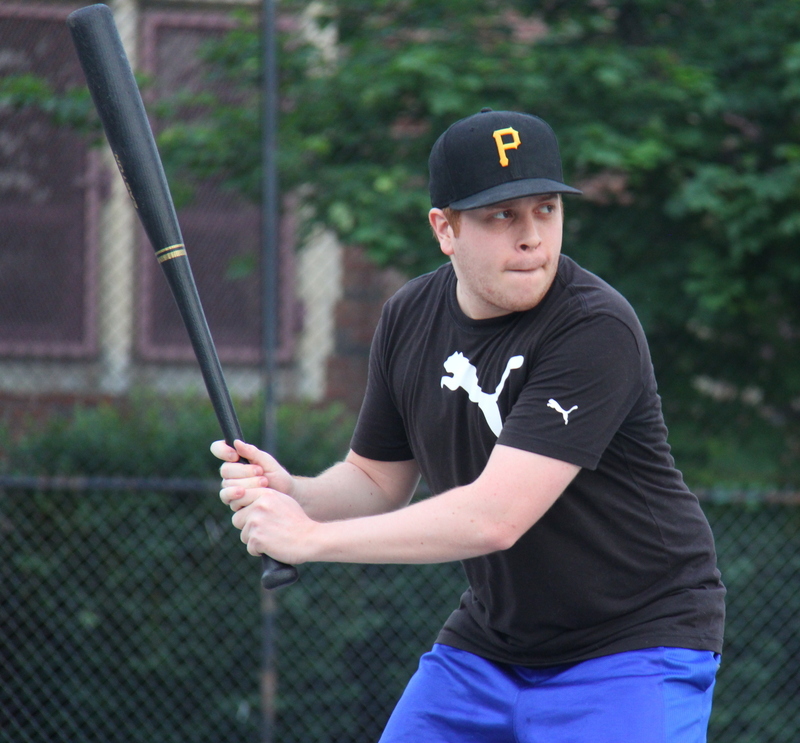 – Steve had the only Ham Slams hits in the game, going 3-for-5 with a single, a double, a triple, and a run scored. Reilly bounced back from his game 1 struggles and followed Bob’s game 2 perfect game with a strong performance on the mound, holding Eastbound & Dahn in check as Questionable Outfit took a 2-1 series lead after an 8-2 game 3 victory. Nate, who was utterly dominant in game 1 of the series, returned to the mound as the game 3 starter for Eastbound & Dahn. Things didn’t fare so well this time around, as Questionable Outfit appeared to have figured out his breaking ball. Tom led off the game with a solo homer, and Questionable was ahead 1-0 early. Morrison would then double, and he scored when Bob followed with a double, making the score 2-0. Reilly grounded out to left-center for the first out of the inning, and Bob moved to third on the play. Tom followed with a one-out single, scoring Bob and putting Questionable ahead 3-0. Morrison followed with a single, and just when it looked like Questionable Outfit would blow the game open, Nate got Bob to fly out to the mound for the second out of the inning, stranding two runners. Down three runs, Eastbound would respond in the bottom of the first. Ivan led off the a single, and Hartley followed with a two-run shot to left-center, making the score 3-2. It looked as if Reilly’s struggles would continue, but he retired the next two batters, ending the inning and maintaining a one run lead. The struggles continued for Nate and Eastbound in the top of the second inning. Reilly led off the inning with a double and moved to third when Kimble grounded out for the first out of the inning. The next batter, Morrison, crushed a two-run homer, and the score was 5-2. Bob followed with a single, and Reilly collected his second hit of the inning with a two-run home run, extending the Questionable Outfit lead to 7-2. Eastbound had seen enough from Nate, and after only 1.5 innings he was replaced by Helal on the mound. Helal retired Tom for the second out of the inning, and Eastbound would trail by 5 runs early. Ivan would single with one out in the bottom of the second, but Eastbound couldn’t cut the deficit, as Reilly retired Hartley to strand the runner. Morrison doubled to start the top of the third, and he moved to second when Bob grounded out to right for the first out of the inning. Reilly followed with a one-out double, scoring Morrison to extend the lead to 8-2. Helal retired Kimble to end the inning, and Questionable Outfit had a commanding six run lead. Reilly rolled through the bottom of the third, retiring the side in order. Helal pitched his first scoreless frame in the top of the fourth, sending Morrison and Bob down consecutively. Reilly maintained the lead in the bottom half of the inning. After retiring Helal, Ivan hit a one-out triple, but Eastbound couldn’t capitalize, as Hartley was retired for the second out of the inning. Helal held the lead in the top of the fifth, pitching another scoreless frame. Reilly matched him in the bottom of the fifth, getting Christian to fly out to the mound before striking out Nate to retire the side. Questionable couldn’t add to their lead in the top of the sixth, as Helal retired Morrison and Bob. Helal had sent down 7 of the last 8 batters he faced, but got no run support to spark a comeback. Down to their final at-bat, Eastbound went quietly in the bottom of the sixth, as Reilly got both Helal and Ivan to fly out, ending the inning and the game. 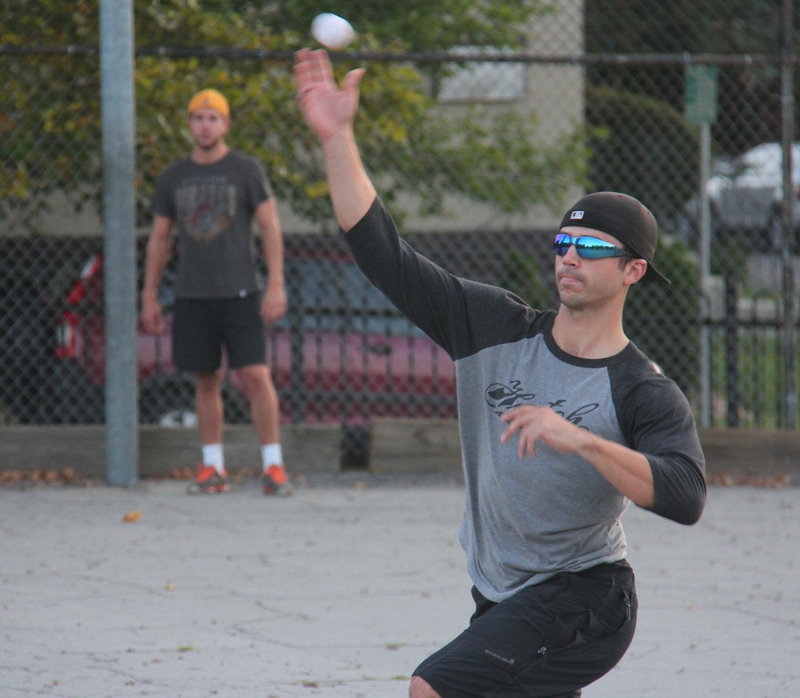 The 8-2 win put Questionable Outfit ahead 2-1 in the best-of-five series and one win away from clinching their second consecutive berth in the Wiffle Series. – Reilly pitched the complete game win for Questionable Outfit, allowing 2 earned runs on 4 hits while striking out 1 in 6 innings. – Nate took the loss for Eastbound & Dahn, giving up 7 runs on 9 hits in 1.5 innings. Helal pitched 4.5 innings of relief, allowing 1 earned run on 2 hits. – Morrison led Questionable Outfit on offense, going 4-for-6 with a single, 2 doubles, a homer, 3 runs scored, and 2 RBI. – Reilly also had 3 hits on the day, going 3-for-5 with a single, a double, a home run, 2 runs scored, and 3 RBI. – Ivan led Eastbound & Dahn on offense, going 3-for-4 with 2 singles, a triple, and a run scored.